If you use Google Voice and don't have a data plan you've most likely come across this issue when trying to make a call. 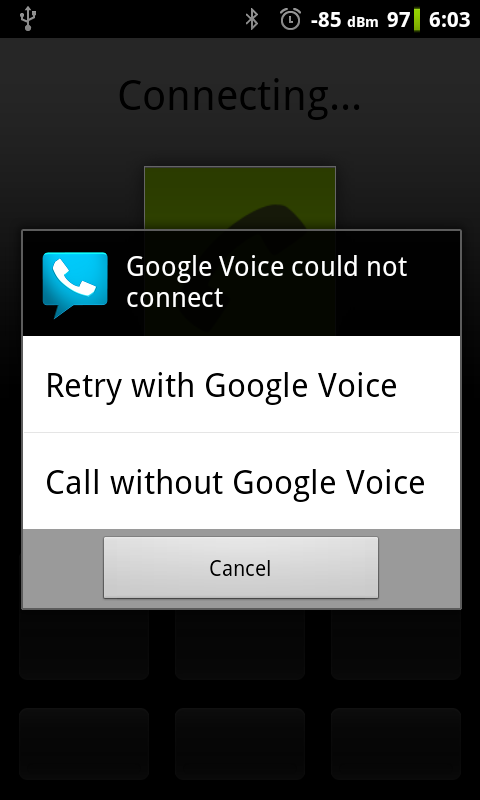 "Google Voice could not connect." This app was made to solve this problem. Prior to this app, the only way to make a call that uses your Google Voice number as your outgoing caller ID is to write down the number, call your voicemail, and then type it in... annoying! After getting sick of doing this (I even went to the extent of adding an extra contact number in my phone that automatically called via GV) I decided to make an app. Voicemail Caller, for lack of a better name, was created. 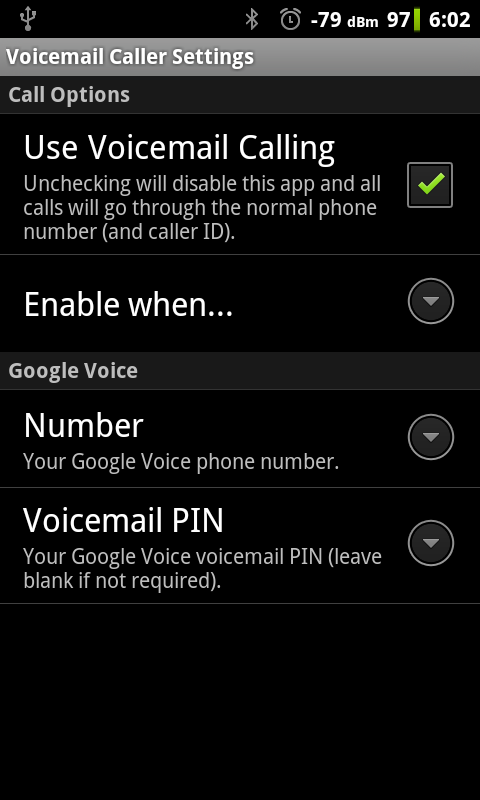 Voicemail Caller automatically makes the call though the Google Voice voicemail when no data connection is present (in which the Google Voice app would normally fail to connect). If data is present, the Google Voice app takes over, so in either case all of the outgoing calls will go through your Google Voice phone number! It can be disabled if you wish to call using the actual phone's number or check your voicemail when no data connection is present. To setup the app, simply install it from the Android Marketplace. Opening the app will allow you to edit the settings. If you have an active data connection or "Use Voicemail calling" is unchecked, this app does nothing! When you make a call, it will call the exact number dialed. If you have no internet connection, when you place a call the app will first call your Google Voice number. 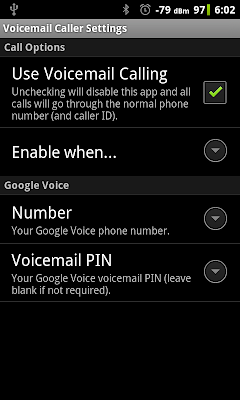 Then it will call the number you originally dialed through the Google Voice menu! I hope this helps! I wrote it in a day so if there's any issues please let me know. If it becomes popular enough, I'll release a new version that fixes the phone number put in the call log annoyance. If you have any ideas for a new app, please let me know! I'm not sure how this works. I installed this app... everytime i call.. it is taking my regular phone connection instead of this app. help me plz! It is designed to only use the app when either 1) There is no Wifi or 2) There is no internet connection (default) depending on the "Enable when..." setting. This is because when you have an internet connection it assumes the Google Voice app make the call. If you want to test the app, either disable your data or set it to "Wifi is not connected" and turn off your wifi, then try to make a call. Thanks!